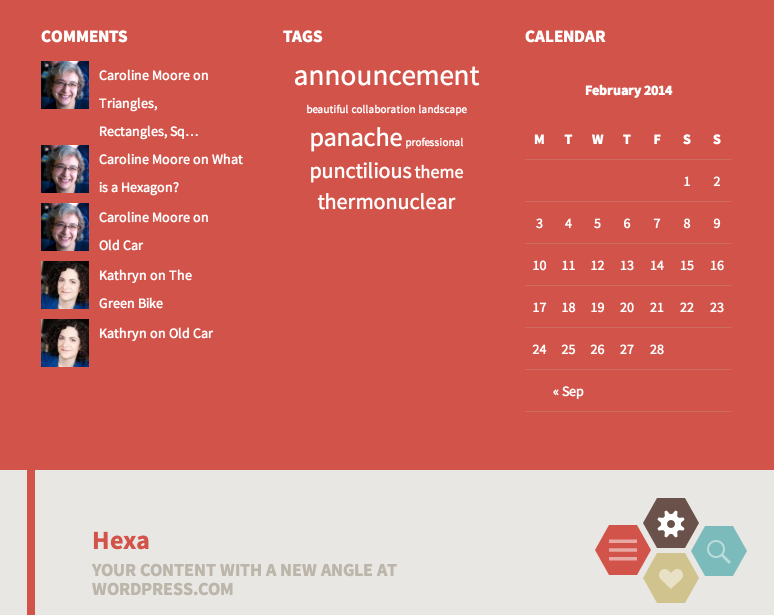 Hexa is a fun, fresh experience for your personal blog. Post formats highlight your best finds in colorful style, and the responsive design looks great on any device, large or small. Read on to find out how to make an eye-catching blog or website with Hexa. Post Formats and Sticky Posts are accented with different colors and icons next to the post content, as seen in the screenshot to the right. Featured Images are displayed above the post content on the blog index and archive pages at 842 pixels wide. Posts with the Image format display the featured image on single post view as well. The main column width is 654. The Header Column widget widths are 207. Featured Images are 842 wide by unlimited height. The Custom Header will display at a maximum height of 200.